In order to achieve and maintain maximum oral health, regular dental visits are essential. A thorough diagnosis and treatment plan will ensure successful oral health. We obtain this with the use of visual examination, digital x-rays, digital cameras, comprehensive periodontal exam, oral cancer screening, and esthetic evaluations. The dental hygienists work together as a team with the doctor and patient to develop the proper diagnosis, treatment plan and provide individualized care for each patient. Many factors contribute to oral health, such as home care, diet, medications, tobacco use, systemic disease (i.e. diabetes), failing dental work and positioning of the teeth. Any of these factors can contribute to an unhealthy mouth. With regular dental visits, meticulous home care, and a healthy lifestyle, a beautiful healthy smile is possible. Yearly X-rays for cavity detection and every 3 years for full mouth. Brushing a minimum of 2 times a day for 2 minutes each time. Flossing a minimum of 1 time a day. A healthy diet- avoid high sugar and high carbohydrate foods or limit those to mealtime. Avoid sodas (even diet sodas) sports drinks, and fruit juices high in sugars. Gingivitis and Periodontal disease are results of an unhealthy mouth. The main cause of gingivitis and periodontal disease is the accumulation of plaque. Plaque is a sticky film of food and bacteria that forms constantly on your teeth. If all of the plaque is not removed each day, it builds up and mineralizes to form tartar, also known as calculus. Once the tartar is formed, it is not removable with home care. Your dental professional must remove it. If it is not removed, it begins to accumulate on the root surfaces. 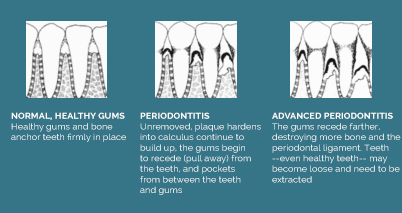 Bacteria that cause periodontal disease thrive in tartar where it begins to produce toxins. It is these toxins, combined with you body’s response to them, which destroys bone and tissue around your teeth. Your dentist and dental hygienist as a dental team can perform a comprehensive oral examination to determine if you have periodontal disease. In office therapies for your condition can be performed along with helping you create a suitable at-home oral health care regime.